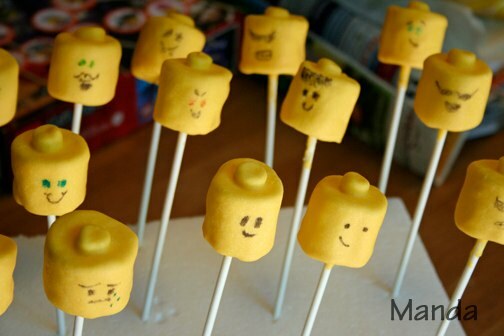 I searched and searched for Lego birthday party ideas all over the web. When I saw these online at LivingLocurto.com, I knew that I had to give these a try. They were easy too! Push a jumbo marshmallow onto a popsicle stick until you feel the stick just below the surface of the top of the marshmallow. Cut a mini marshmallow in half and stick it to the top of your marshmallow on the popsicle stick. Push it onto the stick until you can feel the stick slightly below the surface of the marshmallow. 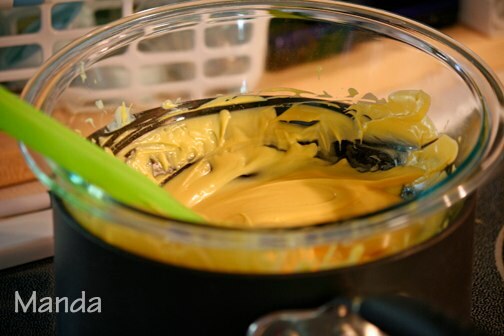 Melt your yellow candy melts using your preferred method (microwave, on the stove, etc). I brought water to almost a boil in a pot, then turned off the heat and put in my glass bowl. This works really great to keep the chocolate melted and smooth while you are working without any special tools. Dunk your marshmallow popsicle into the melted candy. 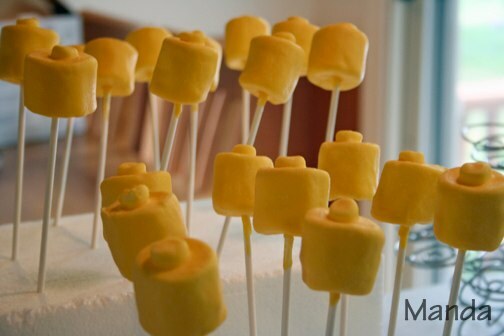 Use a small spatula to make sure all areas of the marshmallow is coated with the yellow candy. Tap the stick gently on the side of your bowl to get rid of any excess candy and ensure even coating. 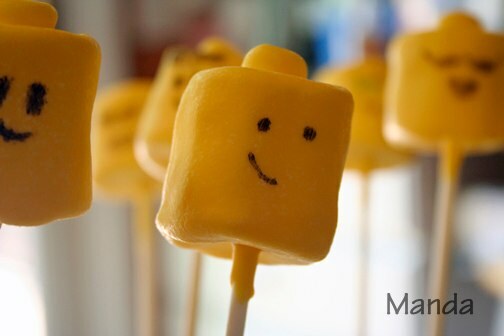 Stick the end of the marshmallow pop into styrofoam. (This will keep your pop upright so there won’t be any flat sides.) You could also use it as a display. 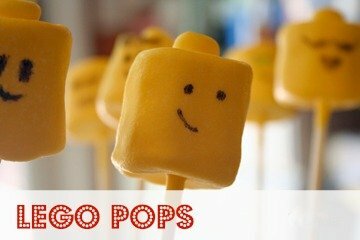 Repeat for as many pops as you like. We also dunked a few jumbo marshmallows without sticks to use as our testers – to practice drawing with our food writers. Once the coating on the pops have dried, you can draw the faces on your pops. Okay, so here’s the skinny on the food writers. The ones I purchased were horrible. I had to return one package because the black didn’t work at all. The second package was better but not by much. So, I don’t recommend the Wilton Food Markers. After reading online, many people preferred these. I will be purchasing those markers for future projects. This was a fun project and G sure thought they were awesome. They were a big hit with the other party goers too. NextWhat have I been up to?